Former Governor of Ilocos Norte and prominent Senator of the Republic, ex-Sen. Bongbong Marcos expressed gratitude towards President Rody Duterte for acknowledging him as a formidable candidate for the presidency and a possible replacement for him once he decided to resign from his post. President Rody Duterte earlier stated in one of his speaking engagement that he is thinking of resigning from his post as the country's chief executive because of the severity of corruptions in the country but refused let VP Leni Robredo as his successor because of his incompetence. Instead of giving down the presidency to his Constitutionally-mandated successor, he wanted to pass through the presidency to either Bongbong Marcos or Sen. Chiz Escudero. The President also noted that he is willing to step down from office as soon as the results of the VP Recount will declare Sen. Bongbong Marcos as the rightful winner in the controversial Vice Presidential race wherein Robredo won despite the earlier advantage of Marcos during the early hours of official counting. Despite the approval of Pres. Duterte to make Marcos as his able successor, the former Governor of Ilocos Norte and prominent member of the Marcos Political Family, hopes that the President would not leave his post. 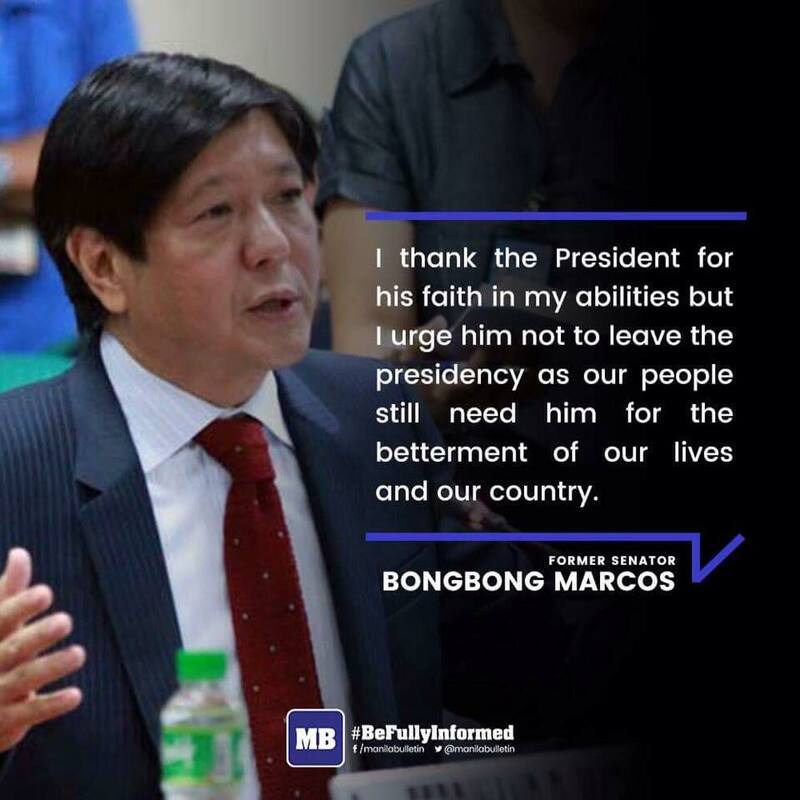 Sen. Bongbong Marcos was quoted as saying "I thank the President for his faith in my abilities but I urge him not to leave the presidency as our people still need him for the betterment of our lives and our country" Marcos expressed. Presidential Spokesperon Harry Roque also confirmed and disclosed to the media that President Duterte will completely step down from his seat if Bongbong Marcos wins the Vice-Presidential poll protest.